An iconic movement blossomed in Parisian circles in the late 1860s. Artists like Claude Monet, Jean-Pierre Renoir and Edward Degas started to forge a new way of painting, opening a window that brought outdoor refreshment to cloistered studios. The movement tried to capture moments, or better, impressions, in painting: the glow of a scene captured by the human eye. Artists took the streets, parks and countryside to portray in heavy brushstrokes the effects of light. Of movement and atmosphere. Of people dancing and flowers glittering on the surface of lakes. Impressionism created a bouquet of moments in painting, colorful and vibrant, impressing the beauty of a thousand moments on canvas. 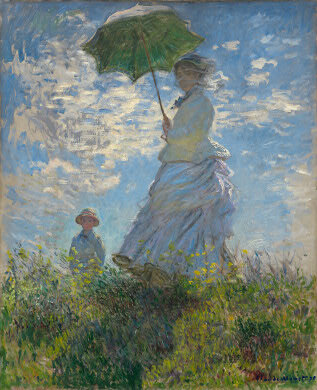 On Woman with a Parasol, Monet displays why he was the leader and symbol of the impressionist group. He portrays his wife Camille and their son Jean strolling along a morning walk, and captures a relaxed moment when they turn back to him, as Camille’s dress flows and breeze touches her face. The sun shines brightly behind them, the enfolding sun of mid-morning, warm and pregnant, anticipating the climax of daylight. Camille’s dress blushes not only with movement, but with the colors around her too: her back flares in white under the sunlight, while the wildflowers below color her front with yellow reflection. Camille and Jean stare back at Monet, and he lets this moment of happiness be impressed on his memory and on painting, and become a graven impression. Yet the angle Monet places himself in makes us long for more still. What could be over the hill? 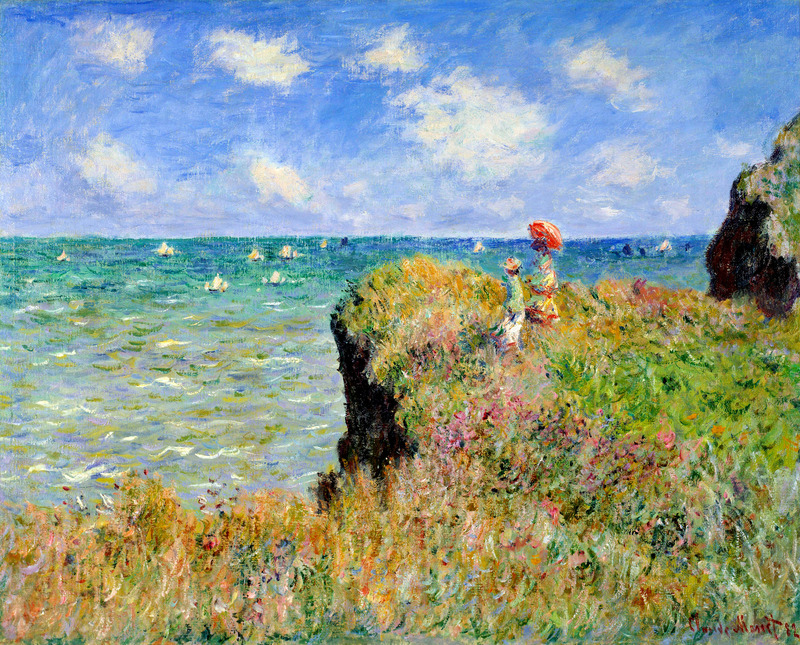 A beach, maybe, where Jean can play and Monet and Camille can listen to the waves? A field to run around and laugh, lifted by the perfume of petals and grass? A wooden restaurant maybe, rustic and rough, sounding of animated conversation and the clang of cutlery? Monet’s angle fires our imaginations with what could lie over the hill, but it also grants this scene a peculiar aura: it transfixes this moment onto the sky, almost like a point in time embedded in eternity. This instant feels like a fragment of heavenly bliss, breathing harmony, glowing with splendor, smelling of homeliness and intimacy. Yet, as eternal as Monet’s impression may seem, sadly it did not last. Camille’s health was fragile, and she died four years after Monet painted this outing, at age 32. Monet became a young widower, and although he married an older woman years later, actually the mother of the girl his second son married, his second marriage never came close to the bond he had with Camille. It provided mature companionship, but the craving for youthful love stayed in the cherished past. Monet’s impression of Camille and Jean in the fields became a memory in his mind, a long gone memory, more distant with each new decade. He continued to cherish his moments and register them in painting – a sunset over the ocean, lilies reflecting on water, a boat resting by the side of the river – but these moments faded with time too, like colorful twilights turning dark. Beauty, at least the kind of beauty the impressionists captured, can for now be only momentary. It comes, but just as we notice it, and raise our spirits in awe, there it goes, superseded by the next moment. It arrives with the freshness but also the brevity of breeze upon our faces, to be savored but not taken, to touch our lips and leave us longing for more. After some years of feverish activity, the impressionist group dismantled, looking for new ways of portraying beauty and eternity in art. “Monet is just an eye,” expressed Cézanne, one of the post-impressionists. Artists like Cézanne, Gauguin and Van Gogh became disillusioned with the materialism of the impressionists, who registered only what the eye can see, and began to search deeper into the human psyche and the structures of reality. But as Cézanne and others criticized Monet as just an eye, he also added, “Though he is a magnificent eye.” Monet’s art may portray ephemeral beauty, and remind us of materialism’s infertile perspective of reality, yet his moments are gorgeous, and prompt us to savor the beauty that now and then visits us. Under Monet’s brush, a simple family picnic rises unto glory, and we come to see the richness of ordinary moments which could otherwise pass unnoticed. A wife’s eye-contact is precious, as is a son waiting to play, as is a hill with a thousand promises behind it, and sometimes it takes art to help us appreciate life’s subtle gifts. We feel like joining Monet’s scene, or enjoying the view and people right in front of us, immersed in a day’s joy and catching an unexpected if brief breath of beauty.